As I am currently playing through the Sword Art Online Fatal Bullet game, I figured that I should finally go and wrap up one of the spin-off manga titles. This one shot is based on the mini Asgard arc and has always been known as a relatively weak story. Unfortunately the manga makes it even worse by adding in a ton of fan service so you can probably already tell how this review is going to end. The manga starts off with Suguha letting Kirito know that some players have finally found out the location of the hidden sword Excalibur. The heroes had found it about a year earlier but because they were so slow the rest of the world caught up. Kirito has to form a group of 7 people in order to conquer this quest but it may prove more dangerous than expected. If the heroes don’t complete the mission quickly than the whole virtual game will turn from a happy fairy based one into an apocalyptic ice land. Fortunately Kirito is up to the task. This is Sword Art Online so I should probably bring up the unfortunate fan service right away since we all know that it’s coming. The manga sets the tone for how this is going to play out right from the beginning as the very first panel on the first page is a fan service shot. The author even mentions at the end that he added more than usual. It is constant enough during the volume where it probably happens every chapter. Some of the scenes are totally made up for the manga and really don’t help the overall case. It really limits what the rest of the manga can hope to accomplish. At least the general art looks pretty good. The characters are very detailed and this translates well into the fight scenes. The quality here is high so it’s too bad that this artist couldn’t have picked a better arc than this one. Of course, this manga also has to have a quick flashback to a certain scene in arc 2 just to fit that extra bit of fan service in. So, very solid art but it’s used for scenes that really don’t help the overall manga. Fortunately Kirito is a pretty solid main character as per usual. He comes up with the plan to save the day and even uses a new skill that is game breaking. He is always surpassing his limits so it should really come as no surprise. Even when everyone tries to mess with Kirito like putting him on the spot by asking if he would pay for the meal, Kirito takes it in stride. He was happy to pay and comes across as a solid team player. Klein unfortunately looks about as bad as ever. He is still a very desperate character who will try to ask out a computer program and he is also super weak. The guy doesn’t even work well as a comic relief character but he does help to make Kirito look even better. That always seems like the real reason Kirito keeps him around. Klein just can’t go one page without humiliating himself. Sinon gets the biggest role from all of the heroines. Unfortunately the author uses it for the wrong reasons at times but at least her fight scenes are solid. Since her bow and arrow skills are double that of the usual max, her weapon is actually pretty overpowered. Her reaction times are likely second only to Kirito’s here so that is very useful as well. Considering that she has apparently had the account for a day (if I recall correctly) Sinon must have trained a great deal. Leafa is around just to feel bad for the creatures getting destroyed by the other players but doesn’t do much beyond that. If anything she can be a little on the annoying side since she knows about the Asgard myths but conveniently forgets about them until right after the fight. Asuna, Lizbeth, and Silica don’t actually get to do anything. They are basically just here to fill up the party. Then we have the main villain who is certainly a terrible character. He’s a very sketchy villain whose goals are terrible and so there is absolutely nothing to root for in his character. There is also the prisoner who has a big plot twist which does not help her character. That’s because her actions up until the plot twist are extremely manipulative and she was basically using the heroes. Certainly not a very nice thing to do if you ask me. Not that it would have been much better without the twist but the character was having too much fun with her role. The plot twist is pretty obvious but the manga does a good job with it since the characters are self aware about it. They all know the twist but decide to play along anyway. Even then they only play along because Klein essentially forced them into doing so. I think the only positive change that the manga did was give Sinon an extended fight. At the very least I don’t recall that happening in the show. It’s not much, but it shows that the manga did something right. With the artist’s skills he/she should still do well in a future SAO manga provided they focus on fight scenes and not adding anything else that would be tragic for the manga’s score. Overall, This was definitely not a good SAO volume and it doesn’t do this wounded franchise any wonders. It just continues to make the same mistakes that the franchise has always made. It had great fight scenes, but is bogged down by all of the fanservice. 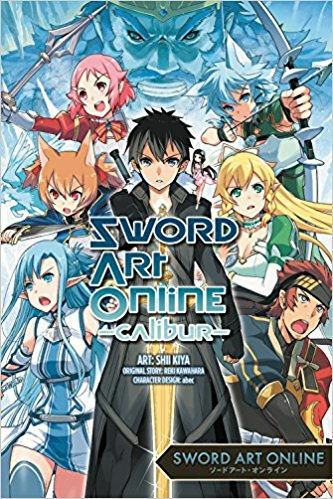 I’d recommend just sticking to the original Sword Art Online manga instead of checking this one out. You’ll thank me for it someday. This entry was posted in Manga, Manga Reviews, Reviews and tagged Action, Fantasy, Kirito, Manga, Manga Review, Review, RPG, Spinoff, Sword Art Online, Video Game by dreager1. Bookmark the permalink. I was hoping that the Calibur arc, in the anime, would be fun as it featured the whole gang. Sadly it was weak filler. At least fan service gives some eye candy to distract from the poor story.